PDB rendering based on 2hi4. 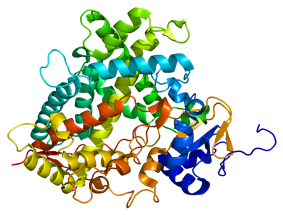 Cytochrome P450 1A2 (abbreviated CYP1A2), a member of the cytochrome P450 mixed-function oxidase system, is involved in the metabolism of xenobiotics in the body. In humans, the CYP1A2 enzyme is encoded by the CYP1A2 gene. 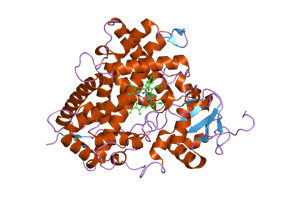 CYP1A2 is a member of the cytochrome P450 superfamily of enzymes. The cytochrome P450 proteins are monooxygenases which catalyze many reactions involved in drug metabolism and synthesis of cholesterol, steroids and other lipids. CYP1A2 localizes to the endoplasmic reticulum and its expression is induced by some polycyclic aromatic hydrocarbons (PAHs), some of which are found in cigarette smoke. The enzyme's endogenous substrate is unknown; however, it is able to metabolize some PAHs to carcinogenic intermediates. Other xenobiotic substrates for this enzyme include caffeine, aflatoxin B1, and acetaminophen. The transcript from this gene contains four Alu sequences flanked by direct repeats in the 3' untranslated region. Expression of CYP1A2 appears to be induced by various dietary constituents. Vegetables such as cabbages, cauliflower and broccoli are known to increase levels of CYP1A2. Lower activity of CYP1A2 in South Asians appears to be due to cooking these vegetables in curries using ingredients such as cumin and turmeric, ingredients known to inhibit the enzyme. Following is a table of selected substrates, inducers and inhibitors of CYP1A2. Strong inhibitor being one that causes at least a 5-fold increase in the plasma AUC values, or more than 80% decrease in clearance. Moderate inhibitor being one that causes at least a 2-fold increase in the plasma AUC values, or 50-80% decrease in clearance. Weak inhibitor being one that causes at least a 1.25-fold but less than 2-fold increase in the plasma AUC values, or 20-50% decrease in clearance. ^ Nelson DR, Zeldin DC, Hoffman SM, Maltais LJ, Wain HM, Nebert DW (January 2004). "Comparison of cytochrome P450 (CYP) genes from the mouse and human genomes, including nomenclature recommendations for genes, pseudogenes and alternative-splice variants". Pharmacogenetics 14 (1): 1–18. ^ Jaiswal AK, Nebert DW, McBride OW, Gonzalez FJ (1987). "Human P(3)450: cDNA and complete protein sequence, repetitive Alu sequences in the 3' nontranslated region, and localization of gene to chromosome 15". J. Exp. Pathol. 3 (1): 1–17. ^ "Entrez Gene: cytochrome P450". ^ Fontana R, Lown K, Paine M, Fortlage L, Santella R, Felton J, Knize M, Greenberg A, Watkins P (1999). "Effects of a chargrilled meat diet on expression of CYP3A, CYP1A, and P-glycoprotein levels in healthy volunteers". Gastroenterology 117 (1): 89–98. ^ Dostalek M, Pistovcakova J, Jurica J, Tomandl J, Linhart I, Sulcová A, Hadasova E (2011). "The effect of St John's wort (hypericum perforatum) on cytochrome p450 1a2 activity in perfused rat liver". Biomedical Papers of the Faculty of Medicine of Palacký University, Olomouc, Czech Republic 155 (3): 253–258. ^ Maliakal, Pius. "Effect of herbal teas on hepatic drug metabolizing enzymes in rats". Journal of Pharmacy and Pharmacology. Retrieved 29 December 2012. ^ Edwards DJ, Bernier SM (1996). "Inhibitory effect of grapefruit juice and its bitter principal, naringenin, on CYP1A2 dependent metabolism of caffeine in man". Life Sciences 59 (13): 1025–1030. ^ Wen X, Wang JS, Neuvonen PJ, Backman JT. "Isoniazid is a mechanism-based inhibitor of cytochrome P450 1A2, 2A6, 2C19 and 3A4 isoforms in human liver microsomes.". ^ Gorski JC, Huang SM, Pinto A, Hamman MA, Hilligoss JK, Zaheer NA, Desai M, Miller M, Hall SD (January 2004). "The effect of echinacea (Echinacea purpurea root) on cytochrome P450 activity in vivo". Clin. Pharmacol. Ther. 75 (1): 89–100. Meijerman I, Beijnen J, Schellens J (2006). "Herb-drug interactions in oncology: focus on mechanisms of induction". Oncologist 11 (7): 742–52. Smith G, Stubbins MJ, Harries LW, Wolf CR (1999). "Molecular genetics of the human cytochrome P450 monooxygenase superfamily.". Xenobiotica 28 (12): 1129–65. Landi MT, Sinha R, Lang NP, Kadlubar FF (1999). "Human cytochrome P4501A2.". IARC Sci. Publ. (148): 173–95. Ikeya K, Jaiswal AK, Owens RA, et al. (1990). "Human CYP1A2: sequence, gene structure, comparison with the mouse and rat orthologous gene, and differences in liver 1A2 mRNA expression.". Mol. Endocrinol. 3 (9): 1399–408. Butler MA, Iwasaki M, Guengerich FP, Kadlubar FF (1989). "Human cytochrome P-450PA (P-450IA2), the phenacetin O-deethylase, is primarily responsible for the hepatic 3-demethylation of caffeine and N-oxidation of carcinogenic arylamines.". Proc. Natl. Acad. Sci. U.S.A. 86 (20): 7696–700. Quattrochi LC, Okino ST, Pendurthi UR, Tukey RH (1986). "Cloning and isolation of human cytochrome P-450 cDNAs homologous to dioxin-inducible rabbit mRNAs encoding P-450 4 and P-450 6.". DNA 4 (5): 395–400. Quattrochi LC, Pendurthi UR, Okino ST, et al. (1986). "Human cytochrome P-450 4 mRNA and gene: part of a multigene family that contains Alu sequences in its mRNA.". Proc. Natl. Acad. Sci. U.S.A. 83 (18): 6731–5. Wrighton SA, Campanile C, Thomas PE, et al. (1986). "Identification of a human liver cytochrome P-450 homologous to the major isosafrole-inducible cytochrome P-450 in the rat.". Mol. Pharmacol. 29 (4): 405–10. Jaiswal AK, Nebert DW, Gonzalez FJ (1986). "Human P3(450): cDNA and complete amino acid sequence.". Nucleic Acids Res. 14 (16): 6773–4. Eugster HP, Probst M, Würgler FE, Sengstag C (1993). "Caffeine, estradiol, and progesterone interact with human CYP1A1 and CYP1A2. Evidence from cDNA-directed expression in Saccharomyces cerevisiae.". Drug Metab. Dispos. 21 (1): 43–9. Schweikl H, Taylor JA, Kitareewan S, et al. (1994). "Expression of CYP1A1 and CYP1A2 genes in human liver.". Pharmacogenetics 3 (5): 239–49. Yamazaki H, Inoue K, Mimura M, et al. (1996). "7-Ethoxycoumarin O-deethylation catalyzed by cytochromes P450 1A2 and 2E1 in human liver microsomes.". Biochem. Pharmacol. 51 (3): 313–9. Hakkola J, Raunio H, Purkunen R, et al. (1996). "Detection of cytochrome P450 gene expression in human placenta in first trimester of pregnancy.". Biochem. Pharmacol. 52 (2): 379–83. Guengerich FP, Johnson WW (1998). "Kinetics of ferric cytochrome P450 reduction by NADPH-cytochrome P450 reductase: rapid reduction in the absence of substrate and variations among cytochrome P450 systems.". Biochemistry 36 (48): 14741–50. Wacke R, Kirchner A, Prall F, et al. (1998). "Up-regulation of cytochrome P450 1A2, 2C9, and 2E1 in chronic pancreatitis.". Pancreas 16 (4): 521–8. Macé K, Bowman ED, Vautravers P, et al. (1998). "Characterisation of xenobiotic-metabolising enzyme expression in human bronchial mucosa and peripheral lung tissues.". Eur. J. Cancer 34 (6): 914–20. Huang JD, Guo WC, Lai MD, et al. (1999). "Detection of a novel cytochrome P-450 1A2 polymorphism (F21L) in Chinese.". Drug Metab. Dispos. 27 (1): 98–101. Tatemichi M, Nomura S, Ogura T, et al. (1999). "Mutagenic activation of environmental carcinogens by microsomes of gastric mucosa with intestinal metaplasia.". Cancer Res. 59 (16): 3893–8.